(Bloomberg Opinion) -- President Donald Trump has renewed his threats to close the U.S.-Mexico border. He has also cut off U.S. State Department assistance to Guatemala, Honduras and El Salvador, the three Central American countries that have sent rising numbers of migrants to the U.S. in recent years. But even if Trump is right that admitting more Central Americans is bad, ending aid to these countries is counterproductive. And closing the border would hurt the U.S. economy. It’s true that apprehensions at U.S.-Mexico border, although still way down from their historic highs two decades ago, have risen during the past year, with an especially large surge in February. Whereas 15 years ago most of the people apprehended were Mexicans trying to cross the border illegally in order to work in the U.S., many now are Central American families and children turning themselves in to the Border Patrol and requesting asylum. The result has been a humanitarian crisis on the border, with asylum seekers overwhelming the Border Patrol’s holding facilities and being kept in poor conditions. 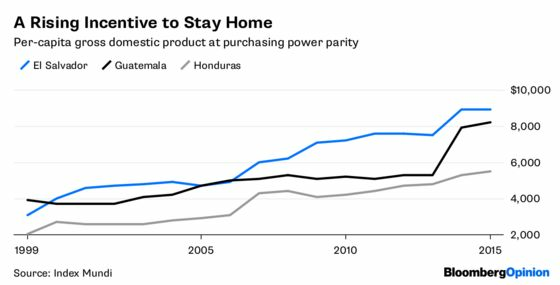 From now on, every dollar that goes to enrich the average Guatemalan or Salvadoran will likely reduce the desire to migrate. Cutting off foreign aid will thus increase the willingness to leave those countries. Closing the U.S.-Mexico border, however, would have much more dire consequences. Trump has declared that because the U.S. has a trade deficit with Mexico, closing the border — which would reduce U.S.-Mexico trade — would be “a profit-making operation” for the U.S. This tweet reveals a deep ignorance of the way trade adds to national income. Some people, including Trump’s trade adviser Peter Navarro — and apparently Trump himself — believe that trade deficits subtract from a country’s gross domestic product. This is just wrong. GDP is the total amount of economic value produced within a country’s borders. Exports add to U.S. GDP, because the U.S. is making goods and services for other countries. But imports, which are made outside U.S. borders, do not subtract from GDP. They are simply not counted in GDP. Thus, even if closing the U.S.-Mexico border reduced or eliminated the U.S.-Mexico trade deficit, it doesn’t mean U.S. incomes would rise. More likely they would fall, since U.S. businesses based on exporting to Mexico and those based on importing things from Mexico would both suffer. In 2017 the U.S. exported 3.7 million tons of coal to Mexico. If a border closure disrupted that trade, it would hurt the very coal miners that Trump has long pledged to save. 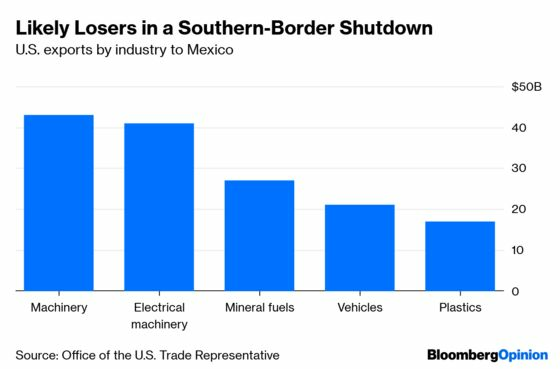 Meanwhile, it’s probably wrong to assume that cutting off imports from Mexico — things like cars and machinery — would result in increased production of those things in the U.S. There would be some increase, as prices for these goods rose, prompting U.S. factories to boost production. But the substitution wouldn’t make up the whole difference — instead, those rising prices would also reduce demand for those products, making U.S. consumers poorer and choking off economic activity. Over the course of 2018, the U.S. experienced substantial increases in…prices...we find that the full incidence of the tariff falls on domestic consumers, with a reduction in U.S. real income of $1.4 billion per month by the end of 2018. As economists predicted, Trump’s tariffs ended up falling mostly on U.S. consumers. A U.S.-Mexico border closure would be even worse. Partial border shutdowns in California have already probably cost Americans quite a lot of money. Trump’s border theater is a self-inflicted wound and dangerous. It will hurt growth at a time when the U.S. economy is looking a bit shaky. Even if Trump takes steps to minimize the economic impact of a border shutdown, as the White House now seems to indicate, a closure would put growth at risk for no good reason. If anything, the plan will probably increase the very migration that Trump wants to reduce. It’s hard to imagine a more wrongheaded approach to the border issue.